“This is one of the only places where Portland hip-hop is the main focus." In December 2018, when a previous tenant moved out of a shared space with Umbrella Screenprinting on North Lombard Street, Portland rapper Swiggle Mandela saw an opportunity. Mandela had long talked with other members of the hip-hop community about opening a storefront, a place where local artists and other creatives could sell their merchandise, music and art. 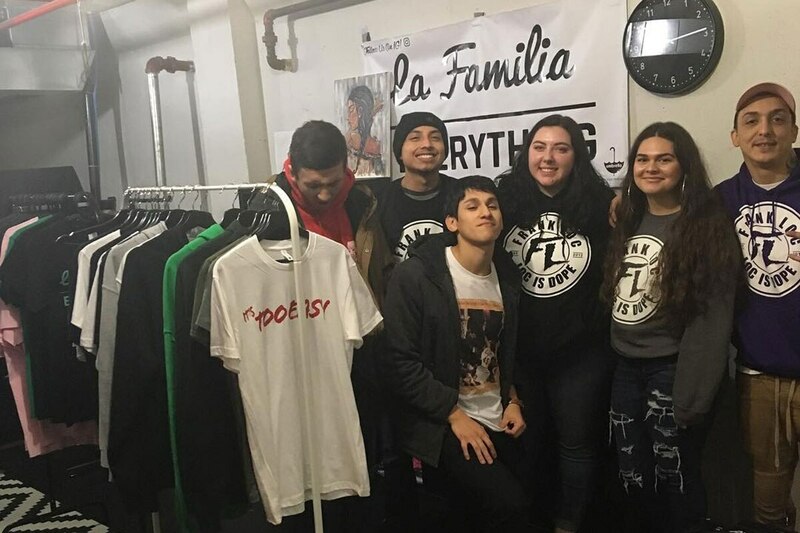 So in partnership with Jeffrey Ta, founder and owner of Umbrella Screenprinting, Mandela recruited more than 20 hip-hop artists, painters, creatives and other members of the hip-hop community to sell their products inside Shop La Familia & Co-Op. "I know artists of all different types," Mandela says. "So I just started reaching out to my network, hip-hop musicians, fashion designers, jewelry designers, painters, people who do sculpture, pottery. And I got a good response." Umbrella's screenprinter sits in the corner of the co-op's shared storefront, and a mélange of clothing, art and merchandise is spread out across the warehouselike space. Along with the usual clothing racks, shirts are tucked into a set of wooden cube organizers. The bright overhead lighting and white walls make it clear there's still room for more art and design work. Mandela has large aspirations for the space, which had its grand opening Jan. 12. He envisions it as a place for listening parties and small shows and as a place dedicated to Portland hip-hop. Mandela says he also sees the co-op as a place for artists just arriving on the scene to make connections and get comfortable performing. "This is one of the only places where Portland hip-hop is the main focus," Mandela says. "It always helps to have space for artists, being able to have events, such as listening parties, just so people have somewhere to go." The co-op gets its name from the music collective Mandela co-founded in 2006, which includes 20 creatives. Mandela says their philosophy is to be one family no matter how you identify or where you come from, and to try to stop discrimination and division in the community. Donovan Smith, an artist, journalist and founder of the clothing brand Ignorant/Reflections, says he has always had his shirts screenprinted by Umbrella Screenprinting. Smith doesn't call himself a rapper, but does consider himself a part of the hip-hop community. His merchandise varies from his fairly new "Hocus POTUS" tee or his "Gentrification Is Weird" shirt he released in 2015. He says he jumped on the opportunity to have his clothing brand sold in the co-op and help build a location that fosters the hip-hop community. "There aren't many physical hip-hop spaces in Portland right now, or Oregon at all," Smith says. Mandela has been performing in Portland since 2005. Over the years, he's had a number of mentors, including veteran Portland rapper Mic Crenshaw, who helped Mandela open for Dead Prez and Immortal Technique before he turned 20. Now, he's trying to mentor younger hip-hop artists. "I just try to show other artists what I know," Mandela says. "I do a lot of shows where if you make a donation you can come perform. I'll have artists that'll come where they're really inexperienced and they'll read their lyrics off their phone. Or you might have an artist that comes who's 40 or 50 and just never had the opportunity to perform." Another Portland hip-hop artist, Mathias Mauk, known as Mighty, met Mandela when the "Stoopid Burger" rapper came to a show where Mighty performed in the early 2000s. "He's one of the top artists, to me personally," Mighty says about Mandela. "He's my favorite artist." Mighty also believes the co-op, which he called a "family-oriented space," is a place where the Portland hip-hop community can come together. "I feel like in every way, the hip-hop culture in Portland needs to stick together and we need to move together," Mighty says. "When you stick together and you move together, it's hard to separate and displace people." Another hip-hop artist selling his merchandise and music at the shop is Demarcus Depass, known as Dmarx. He says Mandela opening the shop is a way to reclaim space in a city that has pushed people of color to the outskirts of town. "It's a beautiful thing. Being in North Portland is especially special," Dmarx says. "It's one of the key elements that makes it really feel so amazing. In a city that is predominately white, that used to be the predominantly black neighborhood. That whole area is gentrified." "To see Swiggle," he adds, "metaphorically and physically getting this land back for people is dope." GO: Shop La Familia & Co-op is at 2205 N Lombard St., instagram.com/shoplafamiliacoop. 10 am-2 pm Tuesday-Thursday, 10 am- 8 pm Friday-Saturday.